If you are tired of trying to fit in a lift chair that is sized for someone else, it is time to discover Golden’s Comforter Series. 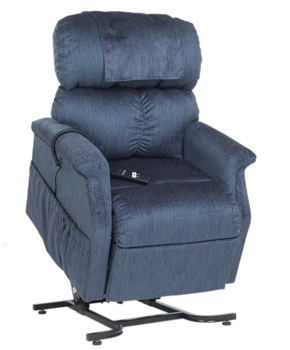 Its plush design provides exceptional lumbar support, and a full chaise pad gives you total body comfort. With 10 distinct sizes, the Comforter Series has your perfect fit. Golden Technologies takes all the worry out of purchasing a lift chair. Their expert craftsmen blend the finest components with superior designs to provide you with the utmost quality, comfort and style. Golden confidently stands behind all of their products and provides you with the best warranties in the industry. 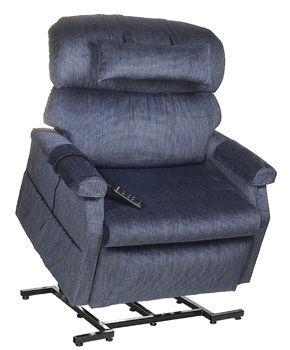 Choose the lift chair that all others are measured against… choose Golden!